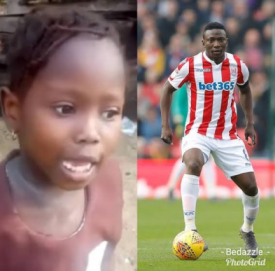 Super Eagles midfielder Oghenekaro Etebo has likened the story of Success, a young primary school pupil, who was sent home from school being a debtor to his childhood days in the streets of Warri, Delta State. Success was sent home by her school management due to her parents' inability to pay her school fees, and was furious while on her way home, stressing that it would have been better for her to be beaten and allowed to stay in school. In a video that traveled far on social media, Success furiously said in pidgin "I never pay, no be say I no go pay o, dem go dey purshu person instead of may dem flog person," she later went away expressing her dissatisfaction while walking away. While relating it to his childhood days, Etebo recalled how he and his elder sister Ronano were serially sent home for not paying school fees. "I remember back then when myself and my sister were serially sent home due to the fact that our parents didn't have the capacity to sort the bills, I know how it feels, particularly when you see other students who have paid." The Rio 2016 Olympics Bronze medalist added that "The amazing thing is that the little girl preferred to be beaten in order to stay back in school and study". He continued by thanking God for everything he is today and stressed the need to always give back to the society, adding that it was the reason he came up with Etebo Oghenekaro Peter Foundation and pleaded with Nigerians to imbibe the culture of rendering assistance. The Stoke City midfielder confirmed that he has joined those with similar ideology to contribute his quota to assisting Success through his Foundation.